As a physics student, you’re obviously concerned with the important questions of the universe. For the most serious among us: How can you launch pumpkins with a pneumatic air cannon for maximum distance and speed … for science? To answer this question, we first need to dive into a bit of detail on pneumatic air cannons. 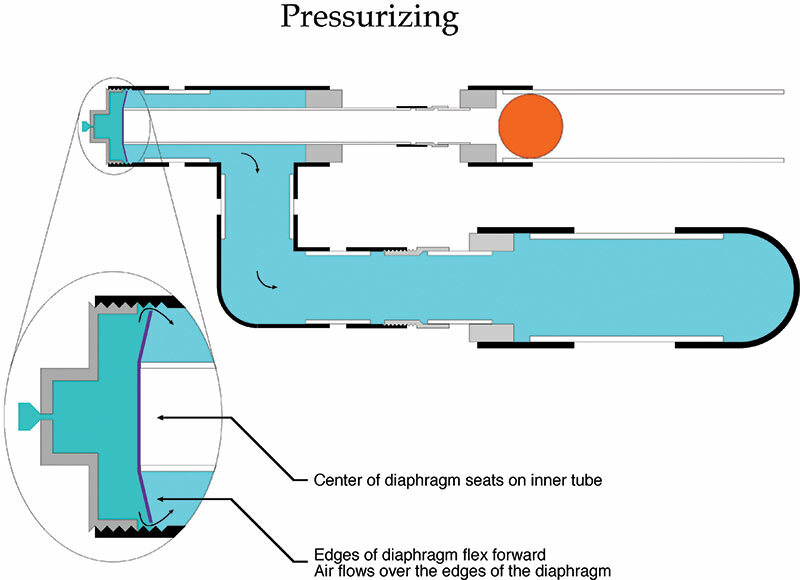 WHAT IS A PNEUMATIC AIR CANNON? A pneumatic air cannon is basically a giant peashooter! Well, similar to one. 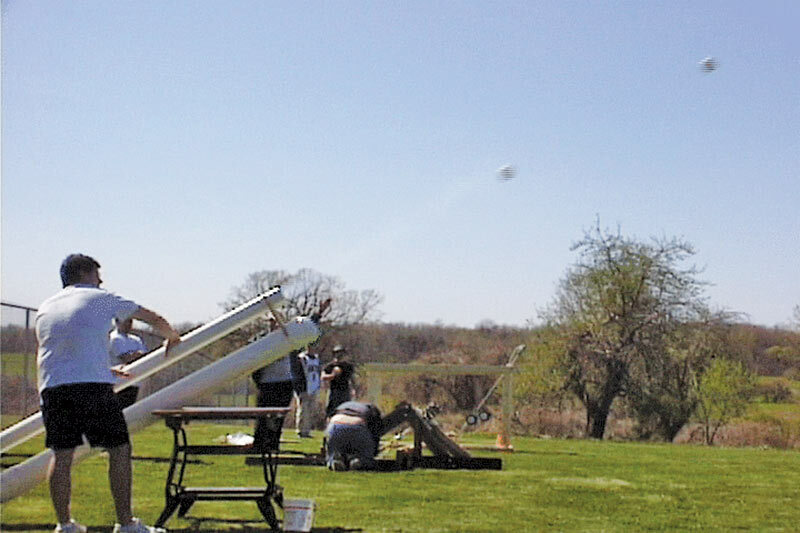 In this case, a pumpkin is placed inside a tube, and a sudden burst of high-pressure air rapidly accelerates the pumpkin down the tube toward certain destruction. Often, this is done using a diaphragm and an air chamber assembly powered by an air compressor, but the main takeaway is that the kinetic energy given to the pumpkin comes from the adiabatic expansion of air! 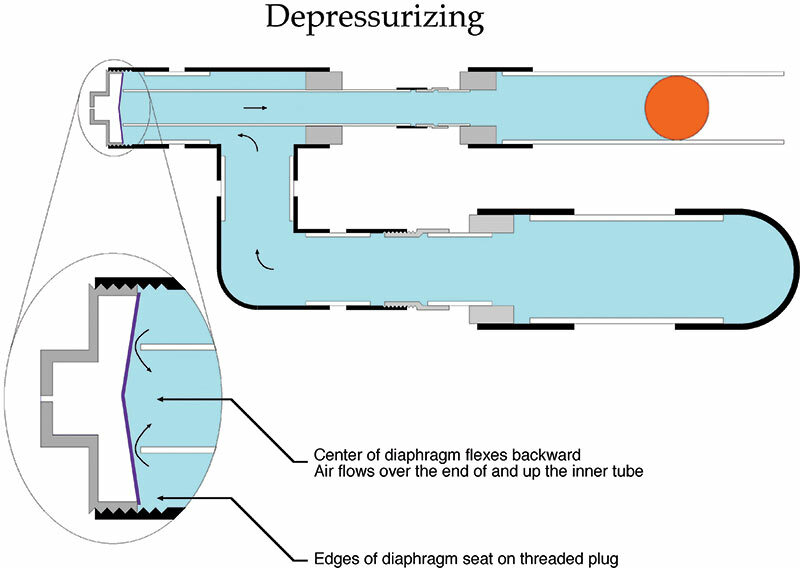 While the specifics of construction depend on payload size and the desired maximum velocity, the general process for a representative type of pneumatic air cannon is shown in the illustration, which outlines how a cavity is pressurized and then this pressurized air is used to accelerate a payload using a diaphragm trigger. Figures courtesy of Rochester Institute of Technology. NOW, FOR THE REAL QUESTIONS: HOW FAR WILL A PUMPKIN PROJECTILE GO? AND HOW FAST? Air resistance, in general, shortens the pumpkin flight time, but you can experiment with different parameters using an amazing PhET simulation,1 which conveniently has a built-in pumpkin setting. For a normalized expansion volume ratio V1/Vo=13/9 and an initial normalized pressure ratio po/pa≅11/2, we arrive at v1≅17paVo/20PR3. Now let’s get real. A tube radius of 0.05 m, a tube length of 2 m, a pressure reservoir of 0.03 m3, and a density of water ≅103 kg/m3(used for the density of fruit) predicts a launch velocity of roughly 150 m/s! Below is a 60-frame-per-second composite picture of a grapefruit being launched in a similar fashion. If the launch tube has an outside diameter of 4.5 inches, how fast was the object going? How does the measured speed compare with the speed predicted by the no-friction theory? Hint: The measured speed should be slower. If you’re looking for a challenge, calculate the coefficient of friction with the answer above. Verify your answer at https://goo.gl/ip8YwL. In case you’re curious, the impact crater was ~1/4 mile away. It’s also worth noting that the air drag coefficient is about 0.5 for a wide range of speeds. At very low speeds and sufficiently high speeds, the coefficient is quite different3 and is a function of the Reynolds number and how smooth the surface of the projectile is. Notice that the dip in the air drag coefficient occurs at lower Reynolds number for rough spheres. This is why golf balls have dimples. For an extra challenge, consider surface roughness. Use your calculated launch speed for the smooth grapefruit from the image, the density of air (1.2 kg/m3), and the dynamic viscosity of air (18 mPaos) to determine an estimate for the air drag coefficient in this case. Is it close to what you would expect? Have your own setup? Reach out to us on social media or email us at sps [at] aip.org ( )with a picture, your specs, and how well theory compares to experiment! Next issue we’ll look at catapults and trebuchets!